Who's your Birmingham Respect candidate? Who’s standing for Respect in the local and General Elections in Birmingham? Find out more here. Check back for regular updates. Slashing public spending will only deepen the recession. Instead of the obsession with cuts we need to invest for growth. This will allow Government income to rise and will cut unemployment. That is the best way to reduce the national debt. Too many lives have been lost. Escalating the conflict will only make things worse. We need to find a peaceful solution. Invest in Green technology to save our planet. the UK could create up to 400,000 jobs in new green industries, instead of wasting tens of billions of pounds on ID cards and Trident nuclear weapons. Everyone is equal no matter their race, religion or lifestyle. We are differet, but we are one society. We should not be divided by racism and intolerance. For more about the things the Respect party and its candidates stands for, visit: www.therespectparty.net and www.salmayaqoob.com. This May you have the chance to elect a new MP. 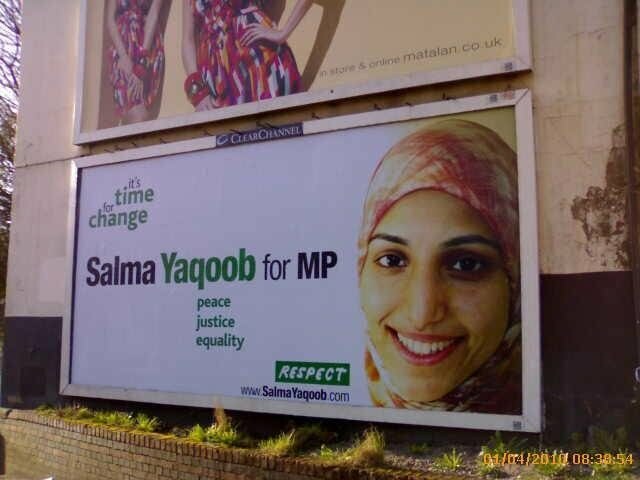 Salma Yaqoob is a brave and committed campaigner. She will speak up for you. – Fed up with politicians lining their own pockets? – Angry at bankers keeping their bonuses? – Let down by the lies that took us to war in Iraq and Afghanistan? Labour in trouble – Labour was shocked to have its majority slashed from 16,246 to 3,289 in 2005. Since then they have become even more unpopular. Lib Dems struggling – Jerry Evans’ vote reduced by half in his own Springfield ward in 2008. In 2009 they only polled 500 votes in the Sparkbrook by-election. Lib Dems are losing support and cannot win.